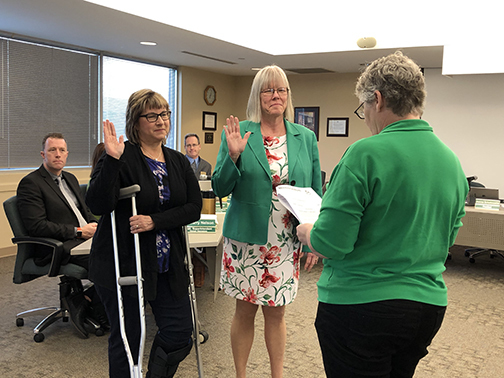 Two board members were sworn into office during the April 9 meeting of the Pattonville Board of Education. Sworn into office were returning board members Mary Kay Campbell and Ruth Petrov. Both were elected to three-year terms during the April 2 general municipal election. The board also voted on officers and annual appointments to various organizations. The officers are as follows: Andrea Glenn, president; Dr. Brian Gray, vice president; Mindy Ridings, secretary; and Campbell, treasurer. Campbell was also appointed to the Pattonville Education Foundation. Jeanne Schottmueller was appointed as a delegate to the Missouri School Boards Association, with Glenn appointed as alternate. Petrov was appointed as the board member to represent Pattonville on the Governing Council of the Special School District, with Dr. Amanda Lienau Purnell as alternate. Re-elected school board members Mary Kay Campbell, center, and Ruth Petrov, left, are sworn into office by Jeanne Schottmueller.